For other uses, see Clevedon (disambiguation). Not to be confused with Cliveden. 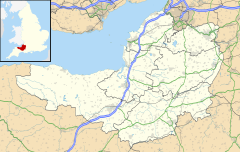 Clevedon (/ˈkliːvdən/, KLEEV-dən) is a town and civil parish in the unitary authority of North Somerset, which covers part of the ceremonial county of Somerset, England. It has a population of 21,281 according to the United Kingdom Census 2011. It lies among a group of small hills, including Church Hill, Wain's Hill (topped by the remains of an Iron Age hill fort), Dial Hill, Strawberry Hill, Castle Hill, Hangstone Hill and Court Hill which is a Site of Special Scientific Interest along the Severn estuary. Though mentioned in the Domesday Book, Clevedon grew in the Victorian period as a seaside resort and in the 20th century as a dormitory town. The seafront has ornamental gardens, a Victorian bandstand and other attractions. Salthouse Field has a light railway running round the perimeter and is used for donkey rides in the summer. The shore consists of pebbled beaches and low rocky cliffs, with an old harbour at the western edge of the town, at the mouth of the Land Yeo. The rocky beach has been designated as the Clevedon Shore Geological Site of Special Scientific Interest. Clevedon Pier, which opened in 1869, is one of the earliest surviving examples of a Victorian pier. On 17 October 1970, two outward spans collapsed when the seventh set of legs from the shore failed during a routine insurance load test. A trust was eventually formed and the pier and its buildings were restored and reopened on 27 May 1989, when the Waverley paddle steamer berthed and took on passengers. Other landmarks include Walton Castle, Clevedon Court the Clock Tower and the Curzon Cinema. Clevedon's light industry is located mainly in industrial estates, including Hither Green Trading Estate near the M5 motorway junction. It is a dormitory town for Bristol. The town is home to educational, religious and cultural buildings and sports clubs. The name derives from the Old English, cleve meaning "cleave" or "cleft" and don meaning "hill". Wain's Hill is an univallate Iron Age hill fort situated approximately 1 mile (1.6 km) south-west of Clevedon. The hill fort is defined by a steep, natural slope from the south and north with two ramparts to the east. The Domesday Book mentions Clevedon as a holding of a tenant-in-chief by the name of Mathew of Mortaigne, with eight villagers and ten smallholders. The parish of Clevedon formed part of the Portbury Hundred. The small rivers the Land Yeo and Middle Yeo supported at least two mills. The Tuck Mills lay in the fields south of Clevedon Court and were used for fulling cloth. Other mills, near Wain's Hill, probably date from the early 17th century. During the Victorian era Clevedon became a popular seaside town; before that it had been an agricultural village. The Victorian craze for bathing in the sea was catered for in the late 19th century by saltwater baths adjacent to the pier (since demolished, though the foundations remain), and bathing machines on the main beach. Clevedon was the site of St Edith's Children's Home for almost 100 years, until it closed in 1974. The home was run by nuns from the Community of the Sisters of the Church, an international body of women within the Anglican Communion, living under the gospel values of poverty, chastity and obedience. The building on Dial Hill is listed, so that the outside has changed little, but now contains privately owned flats. The first large-scale production of penicillin took place in the town. In 1938 Howard Florey was working at Lincoln College, Oxford University with Ernst Boris Chain and Norman Heatley, when he read Alexander Fleming's paper discussing the antibacterial effects of Penicillium notatum mould. He made arrangements for this to be grown in deep culture tanks at the Medical Research Council's Antibiotic Research Station in Clevedon, enabling mass production of this mould for the injections of the forthcoming soldiers of World War II who suffered from infections. Clevedon was served by a short branch line from the main railway at Yatton. It opened in 1847, six years after the main line itself, but closed in 1966. The site of the station is now Queen's Square, a shopping precinct. The town was the headquarters for another railway, the Weston, Clevedon and Portishead Light Railway, which connected the three coastal towns in its name. It opened to Weston-super-Mare in 1897, was extended to Portishead ten years later, and closed in 1940. Its trains crossed the road in the town centre, known as The Triangle, preceded by a man with red and green flags. The town has seven electoral wards. Their area and population are the same as mentioned above. Clevedon falls within the non-metropolitan district of North Somerset unitary authority which replaced the Woodspring district, having formerly been part of Somerset, and between 1974 and 1996 within the county of Avon. Until 2010 the parliamentary constituency was still called Woodspring. Following the review of parliamentary representation by the Boundary Commission for England in Somerset, this seat was renamed North Somerset. It elects one Member of Parliament (MP), currently Liam Fox of the Conservative Party. It is also part of the South West England constituency of the European Parliament, which currently elects six MEPs using the d'Hondt method of party-list proportional representation. Clevedon is situated on and round seven hills called Church Hill, Wain's Hill (which is topped by the remains of an Iron Age hill fort), Dial Hill, Strawberry Hill, Castle Hill, Hangstone hill and Court Hill which is a Site of Special Scientific Interest. On a clear day there are far reaching views across the Severn estuary to Wales. When the visibility is good the islands of Steep Holm and Flat Holm in the Bristol Channel can be seen. The tidal rise and fall in the Severn Estuary and Bristol Channel can be as great as 14.5 m (48 ft), second only to Bay of Fundy in Eastern Canada. The seafront stretches for approximately half a mile from the pier to Salthouse Field, and includes ornamental gardens, a Victorian bandstand, a bowling green, tennis courts, crazy golf and other amusements. An addition to this list is Marine Lake, which was once a Victorian swimming pool, is now used for boating activities, as well as a small festival once a year where people can try out new sports. The Salthouse Field has a light railway running round the perimeter and is still used for donkey rides during the summer. The shore at Clevedon is a mixture of pebbled beaches and low rocky cliffs, with the old harbour being at the western edge of the town at the mouth of the Land Yeo river. It is remembered as the place at which John Ashley conceived of the idea of creating The Mission to Seafarers. The rocky beach, which has been designated as the Clevedon Shore geological Site of Special Scientific Interest. It is the side of a mineralised fault, which runs east-west adjacent to the pier, and forms a small cliff feature in Dolomitic Conglomerate on the north side of Clevedon Beach, containing cream to pink baryte together with sulfides. The minerals identified at the site include: haematite, chalcopyrite, tennantite, galena, tetrahedrite, bornite, pyrite, marcasite, enargite and sphalerite. Secondary alteration of this assemblage has produced idaite, Covellite and other Copper sulphides. "Poet's Walk" is a footpath around Wain's Hill and Church Hill, to the south west of the seafront, and the upper part of the town contains many other footpaths through parks and wooded areas which were laid out in the nineteenth century. The name of the walk is a commemoration of the poets and writers who have visited Clevedon. These include Coleridge in 1795 and Tennyson in 1834. It is a local nature reserve covering Church Hill and Wain's Hill and includes calcareous grassland, coastal scrub and woodland. Along with the rest of South West England, Clevedon has a temperate climate which is generally wetter and milder than the rest of the country. The annual mean temperature is approximately 10 °C (50.0 °F). Seasonal temperature variation is less extreme than most of the United Kingdom because of the adjacent sea temperatures. The summer months of July and August are the warmest with mean daily maxima of approximately 21 °C (69.8 °F). In winter mean minimum temperatures of 1 °C (33.8 °F) or 2 °C (35.6 °F) are common. In the summer the Azores high pressure affects the south-west of England, however convective cloud sometimes forms inland, reducing the number of hours of sunshine. Annual sunshine rates are slightly less than the regional average of 1,600 hours. In December 1998 there were 20 days without sun recorded at Yeovilton. Most of the rainfall in the South-West is caused by Atlantic depressions or by convection. Most of the rainfall in autumn and winter is caused by the Atlantic depressions, which is when they are most active. In summer, a large proportion of the rainfall is caused by sun heating the ground leading to convection and to showers and thunderstorms. Average rainfall is around 700 mm (28 in). About 8–15 days of snowfall is typical. November to March have the highest mean wind speeds, and June to August have the lightest winds. The predominant wind direction is from the south-west. The town has a population of 21,957 according to the United Kingdom Census 2001. Of these almost 20 per cent are over the age of 65 years and 98.8 per cent are white. Almost three quarters of the population described themselves as being Christian, with 17.4% having no religion and another 7.3% not stating any religion. Of the 15,408 people between the ages of 16 and 74, 72.4 per cent are economically active. Clevedon has some light industry, mainly in industrial estates including Hither Green Trading Estate near the M5 motorway junction, and it is also a dormitory town for Bristol. The Clerical Medical pensions and investments group, part of HBOS, had its headquarters in the town on the former site of the Hales Cakes factory, but after its closure, North Somerset Council entered into talks to take over the lease. Percy Daniel & Co is a firm of organ builders, whose work includes the instrument in Brentwood Cathedral. Yeates Removals was established in 1910 using horses and carts for general haulage in Clevedon and the surrounding areas. The removals company has always been run by family members and is currently headed up by James Griffin who took over from his father John in 2001. Clevedon Pier was opened on Easter Monday 1869, one of the earliest examples of a Victorian pier still in existence in the United Kingdom. After a set of legs collapsed during an insurance load check on 17 October 1970, it fell into disrepair until in 1985 the pier was dismantled and taken to Portishead dock for restoration, and was rebuilt in 1986. In 2001, the pier was upgraded to a grade 1 listed building, The Paddle Steamer Waverley and Motor Vessel Balmoral offer day sea trips from Clevedon Pier to various destinations along the Bristol Channel and Severn estuary. Adjoining the pier and contemporary with it is the Toll House, built in the style of a folly castle and provided as accommodation for the pier-master. The Royal Pier Hotel is a Grade II listed building located next to the pier. The Royal Pier Hotel was built in 1823 by Thomas Hollyman, and originally called The Rock House. In 1868, the building was expanded by local architect Hans Price and renamed Rock House & Royal Pier Hotel, later shortened to Royal Pier Hotel. After its closure in 2001 the building fell into disrepair, but it was being converted into luxury apartments in the summer of 2015. Walton Castle is a 17th-century fort located on Castle Hill that overlooks the Walton St Mary area at the northern end of Clevedon. It was built sometime between 1615 and 1620. The castle was designed as a hunting lodge for Lord Poulett, a Somerset MP. The English Civil War saw the decline of Poulett's fortunes, and by 1791 the castle was derelict and being used as a dairy by a local farmer. In 1978, the castle was purchased for £1 by Martin Sessions-Hodge, who restored the building to its former glory. Clevedon Court is on Court Hill east of the town centre, close to the road to Bristol. It is one of only a few remaining 14th century manorial halls in England, having been built by Sir John de Clevedon circa 1320. Since the early eighteenth century the house has been owned by the Elton family, who were responsible for much building work on the house and many improvements in the town, and although the house itself is now owned by the National Trust, the associated estates are still owned by the Elton family. Sir Edmund Elton (1846–1920) was a potter who produced unusually shaped ware in a variety of richly coloured glazes, including a gold glaze of his own invention, at the Clevedon Elton Sunflower Pottery. Clevedon clock tower in the centre of the town is decorated with "Elton ware". It was completed in 1898, and donated by Sir Edmund Elton in celebration of Queen Victoria's Jubilee. The Curzon cinema was built in 1912, for Victor Cox, and is one of the oldest purpose-built, continuously operated cinemas in the world. The town's market hall on Alexandra Road was designed by local architect Hans Price. A monument, known as the "Spirit of Clevedon", was erected near the seafront to mark the Millennium. Unveiled in June 2000, the 5 ft (1.5 m) tall sculpture cost £9,000. It was designed by local citizens and includes panels and plaques representing the history and community in the town. Within its base is a time capsule containing information about the town. Clevedon School is a large secondary comprehensive school serving the whole town and surrounding rural areas. It has about 1,200 pupils in years 7 to 11 (Lower School) and 12 to 13 (Upper School or sixth form). The school has regained its Language College status. There are six primary schools in the town: Mary Elton Primary School, St John the Evangelist of Bath and Wells Academy Trust Church of England School, All Saints C of E Primary School and St Nicholas' Chantry CEVC Primary School. Yeo Moor Primary School, which opened on 19 April 2010, amalgamating the infant and junior schools that shared the existing site. The footballer Jack Butland attended Yeo Moor School and Clevedon Community School. St Brandon's School was an independent boarding school until 1991 and a co-educational infant and junior school until 2004. A drama company, Take The Lead from Clevedon School, has put on productions in the town. Clevedon is home to an air-transport pilot license ground school establishment, Bristol Groundschool, responsible for training a large number of the UK's airline pilots. There are several churches serving the town, including St. Andrew's church, which was built in the thirteenth century AD, although there are thought to be Saxon foundations under the present building. It is the burial place of Arthur Hallam, subject of the poem In Memoriam A.H.H. by his friend Alfred, Lord Tennyson. The Church of St John was built in 1875, by William Butterfield for Sir Arthur Elton. The Church of All Saints was built in 1861 by C E Giles. The tower of Christ Church, on Chapel Hill, is a very important landmark in Clevedon. It was erected 1838 and 1839 from designs by Thomas Rickman in an early 14th-century style. The Copse Road Chapel is an Independent Evangelical Church, which was built in 1851 and has been attributed to Foster and Wood of Bristol, who also designed the United Reformed Church on Hill Road. The Roman Catholic church of the Immaculate Conception is served by the Franciscan order. Station name boards note Yatton is "for Clevedon". Following the closure of the Clevedon Branch Line in 1966, Yatton is the closest station to Clevedon. The nearest railway station is Yatton on the Bristol to Exeter Line, with trains provided by Great Western Railway. Clevedon was previously served by a branch line from Yatton, however this closed in 1966, and the site of the town station is now a shopping centre. The Weston, Clevedon and Portishead Light Railway also served the town. In 1863, Sir Arthur Elton, 7th Baronet of Clevedon Court was largely responsible for the creation of the Clevedon Waterworks Company, which had built the first water works and sewage treatment works in Clevedon by 1867. Features included reservoirs to the north of Dial Hill and Old Street pumping station. However, as the population increased, the water works proved to be inadequate, and a new pumping station was created on Tickenham Road in 1901, some 1.2 miles (2 km) to the north-east. The new site could be seen from Clevedon Court, and the 8th Baronet, Sir Edmund Elton, took exception to the designs of the engineer James Mansergh, so the Waterworks Company employed the architect Henry Dare Bryan to improve the appearance of the buildings, which included the pumping station, a coal shed and store, a lodge for the foreman, and the boundary wall and gates. The original pumping station was reused as a fire station. The new pumping station contained a vertical triple-expansion engine manufactured by the Scottish company Glenfield and Kennedy. This was upgraded to a Marshal horizontal compound engine in 1916, and was again replaced in 1938, when a steam turbine was fitted. The boiler house, engine house and chimney are grade II listed, as they are largely unaltered buildings in Domestic Revival style, with the interior retaining its glazed tiling and elaborate roof trusses, although the machinery has been replaced by modern equipment, and the site is still operational. Clevedon Waterworks Company were one of the first of the smaller waterworks in the region to amalgamate with Bristol Water, which occurred on 1 January 1953. At the pumphouse, water is extracted from a well, which is 110 feet (33.53 m) deep. The upper 69 feet (21 m) are lined with brick, and the well supplies around 990,000 imperial gallons (4.5 Ml) of water to the public supply network each day. Because of its location watersports are a feature of the local scene. Clevedon Canoe Club is based at the marine lake and facilitates sea paddling trips along the North Somerset coast on the Severn Estuary, and to other sites such as the Wye Valley and Woolacombe. Nearby is based the Clevedon Sailing Club. Clevedon Cricket Club was established in 1874. The first team now plays in the Bristol and Somerset division of the West of England Premier League. Clevedon Town Football Club was started in the late 19th century and were one of the founder members of the Western Football League, winning its championship in the 1990s. The football club plays at the Everyone Active Stadium, formerly known as the Hand Stadium. Another Non-League football club, Clevedon United F.C., plays at Colleridge Vale. Clevedon Bowling Club was formed in 1910, and since then has achieved several international honours in Bowls. Other sporting facilities include Clevedon Golf Club, which has a Par 72, 6,500 yard course, Riding Centre, Rugby Club, and a range of others. Literary figures associated with the town are Samuel Taylor Coleridge (who spent some months living in a cottage in the town after his marriage to Sara Fricker), William Makepeace Thackeray (a frequent guest of the Elton family at Clevedon Court), and George Gissing (The Odd Women is set in the town). In the 1993 movie, The Remains of the Day, starring Anthony Hopkins, Emma Thompson and Christopher Reeve, references are made to Clevedon, where the final scene of the film is set and was filmed. The television movie Cider with Rosie (1998) also featured scenes filmed in the town. Scenes from the 2010 film, Never Let Me Go, starring Keira Knightley were filmed in Clevedon during the summer of 2009. Clevedon has its own comic book superhero, Captain Clevedon. Clevedon is twinned with Ettlingen, in Baden-Württemberg, Germany since 1980; Épernay, France since 1990; and Middelkerke, Belgium since 1991. Clevedon was the setting for the eponymous town Broadchurch, a detective drama first aired on ITV on 4 March 2013. Emma Jane Guyton (1825–1887, born Worboise), novelist and editor, died in Clevedon. Frances Freeling Broderip (1830–1878), children's writer, died in Clevedon. Tuppence Middleton (born 1987), film and TV actress, grew up in Clevedon. ^ a b c "2011 Census Profile". North Somerset Council. Archived from the original (Excel) on 4 January 2014. Retrieved 4 January 2014. ^ "Clevedon tourist information". Touruk.co.uk. 15 April 1912. Archived from the original on 13 April 2009. Retrieved 21 April 2009. ^ Newman, Paul (1976). Channel Passage. Kingsmead Press. p. 10. ISBN 978-0-901571-74-8. ^ "Wain's Hill fort". National Monuments Record. English Heritage. Archived from the original on 2 October 2012. Retrieved 6 March 2011. ^ a b "Clevedon — Somerset, UK". Somersetguide.co.uk. 21 July 2007. Archived from the original on 30 April 2009. Retrieved 25 April 2009. ^ "Medieval Times". Clevedon Civic Society. Archived from the original on 26 July 2011. Retrieved 21 August 2010. ^ "Somerset Hundreds". GENUKI. Archived from the original on 19 January 2012. Retrieved 19 October 2011. ^ Poole, Ruth; Knight, Norma; Horman, Phyllis; Rew, Wilfred; Lilly, Jane. "Mills on the Land Yeo: Further discoveries" (PDF). Nailsea and District Local History Society. Archived (PDF) from the original on 27 August 2011. Retrieved 28 April 2011. ^ "About Clevedon". Clevedon Town Council. Archived from the original on 7 August 2010. Retrieved 30 August 2010. ^ Campbell, Rob; Clevedon Civic Society (2009). Clevedon: Medieval Manor to Victorian Resort. Matador. p. 216. ISBN 978-1-84876-175-9. Retrieved 21 August 2010. ^ "Clevedon". Community of the sisters of the church. Archived from the original on 27 July 2011. Retrieved 24 August 2010. ^ "St Edith's Orphanage". Images of England. English Heritage. Archived from the original on 26 October 2012. Retrieved 24 August 2010. ^ Sneader, Walter (2005). "Drugs from naturally occurring prototypes: Drugs from micro-organisms". Drug Discovery: A History. WileyBlackwell. p. 296. ISBN 978-0-471-89980-8. ^ Maggs, Colin G (1987). The Clevedon Branch. Didcot: Wild Swan Publications. pp. 1–2. ISBN 0-906867-52-5. ^ Maggs 1987, pp. 65–66. ^ "Bristol — Coast — The railway arrives in town". BBC. Archived from the original on 19 May 2008. Retrieved 21 April 2009. ^ Redwood, Christopher (1981). The Weston, Clevedon and Portishead Railway. Weston-super-Mare: Sequoia Publishing. p. 32. ISBN 0-905466-42-X. ^ Redwood 1981, p. 46. ^ Redwood 1981, p. 74–75. ^ "Clevedon Triangle crossing". Weston Clevedon and Portishead Railway. Portishead web. Archived from the original on 24 May 2015. Retrieved 10 May 2010. ^ "Court Hill SSSI" (PDF). English Nature. Archived from the original (PDF) on 24 May 2011. Retrieved 30 April 2010. ^ "Salthouse Fields". Clevedon.org. Retrieved 30 March 2010. ^ a b Farr, Grahame (1954). Somerset Harbours. London: Christopher Johnson. p. 65. ^ "Clevedon Shore SSSI" (PDF). English Nature. Archived (PDF) from the original on 24 May 2011. Retrieved 30 April 2010. ^ "Poet's Walk Local Nature Reserve, Clevedon". Avon Local Nature Reserves. Archived from the original on 23 September 2015. Retrieved 23 August 2015. ^ "North Somerset Council to take over Clerical Medical Castlewood | Clevedon news". This is Somerset. 10 August 2009. Archived from the original on 17 February 2012. Retrieved 14 August 2009. ^ "The Organ in Brentwood Cathedral". Brentwood Cathedral Music. Archived from the original on 31 March 2009. Retrieved 30 April 2010. ^ "Yeates Removals, Storage & Shredding, Clevedon". InNorthSomerset. 10 August 2015. Archived from the original on 25 September 2015. Retrieved 14 August 2015. ^ a b "The Pier, including the Tollhouse". Images of England. Archived from the original on 23 July 2009. Retrieved 20 February 2008. ^ "Royal Pier Hotel, Marine Parade, Clevedon". North Somerset Council. 8 December 2005. Archived from the original on 27 September 2007. Retrieved 25 October 2008. ^ "Pier wins top listing". BBC News. BBC. 15 January 2002. Retrieved 25 October 2008. ^ "Boat trips". Clevedon pier and heritage trust. Archived from the original on 31 August 2010. Retrieved 10 May 2010. ^ "Pier and Toll House, Clevedon". britishlistedbuildings.co.uk. 28 May 2011. Archived from the original on 27 September 2012. ^ "|Royal Pier Hotel, Clevedon, Julia Elton, criticises delisting proposal | This is Clevedon". Thisissomerset.co.uk. 20 May 2009. Archived from the original on 21 July 2009. Retrieved 11 June 2009. ^ Pope, Samantha (29 November 2010). "Major plans for Clevedon Pier and the derelict Royal Pier Hotel". North Somerset Times. Retrieved 15 August 2017. ^ "UK | England | Somerset | Plea for hotel plan to get moving". BBC News. 23 April 2007. Retrieved 11 June 2009. ^ "History". Waltoncastle.co.uk. Archived from the original on 19 July 2009. Retrieved 12 June 2009. ^ Jackson, Penny (16 June 2004). "King of the hill — Property, House & Home". London: The Independent. Archived from the original on 31 August 2010. Retrieved 12 June 2009. ^ "Clevedon Court". Images of England. Archived from the original on 25 July 2009. Retrieved 20 February 2008. ^ "Clevedon Court". National Trust. Archived from the original on 22 January 2008. Retrieved 20 February 2008. ^ "Swallow teapot". Lawson Park. Grizedale Arts. Archived from the original on 1 July 2011. Retrieved 10 May 2010. ^ "Clock Tower". Images of England. Archived from the original on 22 July 2009. Retrieved 20 February 2008. ^ "Other Places of Interest". Views of Clevedon. Archived from the original on 23 July 2011. Retrieved 30 March 2010. ^ "The Curzon Community Cinema, Clevedon: History". Curzon.org.uk. 20 April 1912. Archived from the original on 23 April 2009. Retrieved 25 April 2009. ^ "Curzon Cinema". Images of England. English Heritage. Archived from the original on 6 June 2011. Retrieved 30 March 2010. ^ Gould, Paul (4 December 2010). "The List: UK's oldest surviving cinemas". Financial Times. Retrieved 15 August 2017. ^ "The Town Market Hall". Images of England. English Heritage. Archived from the original on 6 June 2011. Retrieved 30 March 2010. ^ "Spirit of Clevedon". Clevedon.org. Archived from the original on 28 August 2008. Retrieved 13 October 2009. ^ "Plaque, Millennium Celebration Monument, Clevedon". Geograph. Archived from the original on 17 October 2012. Retrieved 30 August 2010. ^ "Clevedon School". Ofsted. Archived from the original on 26 May 2011. Retrieved 30 March 2010. ^ "Schools near Clevedon, Somerset". Directgov. Archived from the original on 3 March 2016. Retrieved 13 October 2009. ^ "Jack's gearing up for England debut". This Is Bristol. 30 September 2008. Archived from the original on 25 September 2012. Retrieved 1 April 2016. ^ Pope, Samantha (10 September 2012). "Age is of no significance – Jack Butland". North Somerset Times. Weston-super-Mare. Retrieved 1 April 2016. ^ "Clevedon Hall – a glimpse into its past". Clevedon Hall. Archived from the original on 1 September 2010. Retrieved 21 August 2010. ^ "Clevedon Hall – a glimpse into its past". Clevedon Hall Estate. 2010. Archived from the original on 12 April 2010. Retrieved 14 April 2010. ^ Pope, Samantha (26 July 2012). "Students take the lead in drama project". North Somerset Times. Archived from the original on 24 December 2016. Retrieved 24 December 2016. ^ "Churches in Clevedon". Clevedon.org. Archived from the original on 28 August 2008. Retrieved 13 October 2009. ^ "Parish Church of St Andrew". Images of England. Archived from the original on 22 July 2009. Retrieved 20 February 2008. ^ "Church of St John". Images of England. English Heritage. Archived from the original on 6 June 2011. Retrieved 30 March 2010. ^ "Church of All Saints". Images of England. English Heritage. Archived from the original on 6 June 2011. Retrieved 30 March 2010. ^ "Christ Church". Images of England. English Heritage. Archived from the original on 6 June 2011. Retrieved 30 March 2010. ^ "Copse Road Chapel". Images of England. English Heritage. Archived from the original on 6 June 2011. Retrieved 30 March 2010. ^ "United Reformed Church". Images of England. English Heritage. Archived from the original on 6 June 2011. Retrieved 30 March 2010. ^ "Our Parish". Clevedon Parish of The Immaculate Conception. Archived from the original on 22 May 2010. Retrieved 30 April 2010. ^ Historic England. "Clevedon Pumping Station (1129714)". National Heritage List for England. Retrieved 13 August 2018. ^ Hodgson, Alan (1991). The story of the Bristol Waterworks Company 1939-1991. Bristol Waterworks Co.
^ "Sources" (PDF). Bristol Water. Retrieved 14 August 2018. ^ "Clevedon Canoe Club". Clevedon Canoe Club. Archived from the original on 5 March 2012. Retrieved 30 March 2010. ^ "Clevedon Sailing Club". Clevedon Sailing Club. Archived from the original on 14 April 2010. Retrieved 30 March 2010. ^ "Clevedon CC". play-cricket. Archived from the original on 7 July 2012. Retrieved 21 August 2010. ^ "History". Clevedon Town FC. Archived from the original on 4 March 2010. Retrieved 30 March 2010. ^ "Clevedon Bowling Club". Clevedon Bowling Club. Archived from the original on 5 March 2012. Retrieved 30 March 2010. ^ "Clevedon Golf Club". Clevedon Golf Club. Archived from the original on 13 April 2010. Retrieved 30 March 2010. ^ "Clevedon riding Centre". Clevedon riding Centre. Archived from the original on 23 July 2010. Retrieved 30 March 2010. ^ "Clevedon Rugby Club". Clevedon Rugby Club. Archived from the original on 9 May 2008. Retrieved 30 March 2010. ^ "Sports and Fitness". Clevedon Town Council. Archived from the original on 9 April 2010. Retrieved 30 March 2010. ^ a b "Welcome to Clevedon" (PDF). Archived from the original (PDF) on 25 May 2010. ^ Gissing, George (2007). The Odd Women. Echo Library. p. 1. ISBN 978-1-4068-1010-3. ^ "The Remains of the Day". IMDB. Archived from the original on 31 August 2011. Retrieved 21 August 2010. ^ "Somerset — Art, Films and Television". BBC. Archived from the original on 30 September 2010. Retrieved 22 August 2010. ^ "Keira Knightley filming Never Let Me Go | Clevedon News". This is Somerset. Archived from the original on 20 October 2009. Retrieved 30 April 2010. ^ "Welcome to the Clevedon Twinning Association Site". Clevedon Town Twinning Association. Archived from the original on 25 July 2009. Retrieved 12 December 2009. ^ "Town to become star of ITV drama". Nailsea, Clevedon and Portishead Times. Archived from the original on 29 November 2014. Retrieved 5 March 2013. ^ "David Tennant's ITV drama Broadchurch transforms parts of Somerset into Dorset". Western Daily Press. Archived from the original on 7 March 2013. Retrieved 5 March 2013. ^ "Broadchurch, ITV". 28 February 2013. Archived from the original on 20 April 2013. Retrieved 5 March 2013. ^ Newman C (October 1975). "Edward Tyson". Br Med J. 4 (5988): 96–7. doi:10.1136/bmj.4.5988.96. PMC 1674957. PMID 1102061. ^ Ousby, Ian (1993). The Cambridge guide to literature in English. Cambridge University Press. p. 189. ISBN 978-0-521-44086-8. ^ "Book outlines past of family's church". Western Daily Press. 4 November 2010. Archived from the original on 10 March 2014. Retrieved 12 May 2014. ^ "Broderip, Frances Freeling". Dictionary of National Biography. London: Smith, Elder & Co. 1885–1900. ^ Rattigan, Neil (2001). British Film and the People's War, 1939–1945. Fairleigh Dickinson Univ Press. p. 245. ISBN 9780838638620. ^ "Graham Tripp". www.cricketarchive.com. Archived from the original on 25 December 2011. Retrieved 14 October 2010. ^ "Bob Anderson". Darts Batabase. Archived from the original on 11 January 2011. Retrieved 27 August 2010. ^ "Profile: Clive Cowdery: Class act who worked his way to top". The Scotsman. 14 August 2009. Archived from the original on 19 February 2017. Retrieved 18 February 2017. ^ "Kate Reed". IAAF. Archived from the original on 31 March 2016. Retrieved 21 March 2016. ^ Woodhall, Victoria (26 January 2013). "One to watch: Tuppence on the money". Daily Mail. Archived from the original on 30 March 2014. Retrieved 30 March 2014. ^ "Memories of Sunnyside is internet hit". Bristol Post. 16 November 2010. Archived from the original on 2 April 2015. Retrieved 24 March 2015. ^ "Jack Butland: Stoke City keeper signs new four-year deal". BBC Sport. Archived from the original on 21 March 2015. Retrieved 20 March 2015. Wikimedia Commons has media related to Clevedon. Wikivoyage has a travel guide for Clevedon. "Clevedon" . Encyclopædia Britannica (11th ed.). 1911.